Vogue Wedding Show 2018 - the one-stop shopping destination for your 2018 Dream Wedding! So it’s taking place on August 3-5 at the Taj Hotel, New Delhi, and like every progressing year, ist going to get grander and more ah-mazing this time! It’s an “invite only” luxury exhibition, which means you can’t just walk into the expo, Click Here to Register or call on +91 9820604936/ +91 9820260913 to get your invites. Pioneer of all things Indian and creator of bespoke designs that are literally better than what bridal dreams are made of, Sabyasachi is a brand brides literally die for! A word from the designer himself, “Retro bohemian glamour will set the mood this year. Destination weddings will especially see bright florals, mirror work, multi-coloured Parsi thread work – all with a tropical edge.”. 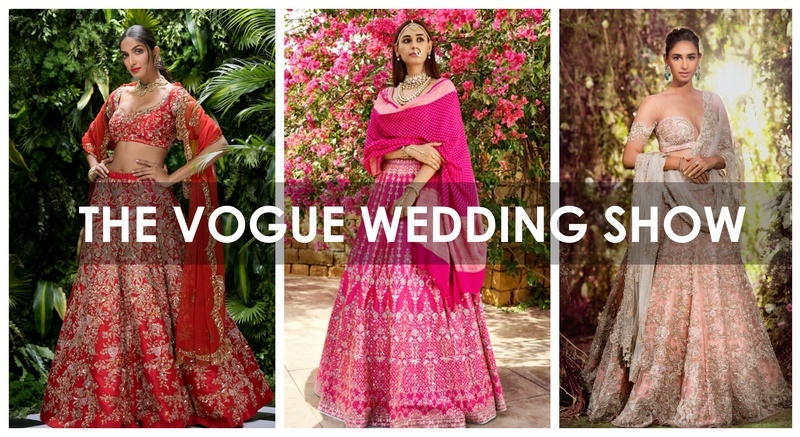 No one reimagines Indian aesthetics in a contemporary language like Anita Dongre, and I’m sure, she’s on your dream list. She’s all set to showcase her, ‘Diary of a Rajkumari’ collection, which has been inspired by Rajasthan’s craft legacy. “We have revisited time-honoured techniques like gota patti with this collection, and used them on tunics, kaftans, lehengas, bandis and jackets,” says the designer. Dongre feels that bridal wear this season is all about embracing the rich cultural heritage of India with Banarasi saris and lehengas in elegant silks. The combination of modern silhouettes and traditional textiles makes for winning looks according to her. While quintessential bridal reds and pinks are always trending, fresh shades of green, blue and ivory also get Dongre’s nod of approval. Tarun Tahiliani has always set out to create the ultimate “India Modern” bridal collection, with a view in the present moment but, ultimately, much steeped in the Indian traditions. The designer creates silhouettes that combine western notions of cut, construct and finish but using Indian heritage and craftsmanship. Here’s a little something about the collection to be showcased, “We have essentially drawn inspiration from all things in the universe – constellations and stars being a core theme for the collection. A hint of romance and fantasy runs through with floral details and subtle Baroque inspired work. The collection offers a range of European colours on one hand, and vibrant colours from the traditional Indian palette on the other side of the spectrum. Falguni and Shane Peacock, this husband-wife duo isn’t the one to follow the herd. They are about to showcase their couture 2018 collection - Amour De Junagarh, which follows the journey of a Parisienne queen who leaves her castle for an Indian Prince, and follows him to the Junagarh Fort mela in Rajasthan. The collection recreates the grandeur of this setting with an array of bridal lehenga sets and voluminous gowns that strike a balance between Indian and western sensibilities. The colours range from nudes to pastels, especially powder blue, accented by jewelled tones. The designers’ advice to brides, “Choose ensembles that feature superior craftsmanship influenced not just by India, but the rest of the world as well. The embroidery must not bog one down; rather the ensemble needs to be effortless and comfortable. Gowns with trains and lehengas with crop tops are fail-safe options. Gaurav Gupta has created a niche for his dramatic sculptural and draped ensembles with his idea of the future, giving each creation an Indo-European feel. Best known for infusing a serious dose of edge to bridal wardrobes, for making the sari-gown a fail-safe wedding season go-to, and for giving conventional Indian wear an avant-garde spin, his designs are mesmerising. The designer strongly feels that it is key that brides wear their personality, and not just trends. “Choose everlasting styles that can be worn even 10-15 years from now. Cool separates are a must in any wardrobe. They can be styled individually and paired with different looks, making them very versatile,” Gupta signs off. This label has been instrumental in infusing trousseau wardrobes with cross-cultural expression and new depictions of what is widely considered traditional. Here’s something about their latest collection they will be showcasing, “We derive inspiration from the strong virtues of discipline, pride and togetherness associated with the Indian armed forces. It’s also a salute to everything Nehruvian. Shyamal & Bhumika, this husband-wife duo’s creations exude the elegance of an era gone by while resonating with the modern Indian diaspora. This is what they have to say about their collection, which is to be showcased, “Traditional embroidery techniques have been used to add intricate crystal and beadwork to all the pieces. The colour palette is a blend of precious jewelled tones and muted shades reminiscent of spring”. Dramatic contemporary silhouettes such as flared lehengas, gowns and floor-length jackets with ruffled detailing and sheer sleeves are the highlight of this line that is as timeless as it is exquisite. Modern sensibilities rooted in Indian heritage, literature and artisanal expertise is the hallmark of every Jade creation. Launched by sisters-in-law Monica Shah and Karishma Swali, the brand’s form-flattering gowns, saris, anarkalis and lehengas transcend trends and generations, serving as modern heirlooms for the millennial Indian bride. They are all geared up to showcase it’s ‘Shreedha’ collection which finds its inspiration in Radha. “For us, Radha is the personification of the pure love between humanity and God. The collection embodies her various facets through a colour palette that’s royal, youthful and earthy. We have worked with tones like azure lapis blue, garnet rose, carmine, sage green, gold and platinum to bring out Radha’s demure yet vibrant traits” explains the duo. Rahul Mishra is a master of structured silhouettes and embroidered fabrics. His creation would look as good in a bride's trousseau as they do on the runway. His collection is always fresh, graceful and completely lightweight making it just right for brides who don't want to get bogged down with the weight of their wedding attire. Because hey, not every bride dreams of wearing a heavy 10 kg lehenga on her wedding day. Some would rather prefer to be dressed in a featherlike stress-free couture that would be comfortable to walk in and easy to breathe in yet make sure the limelight is on them! So, what are you waiting for? Go register yourself for this Dream Exhibition NOW! Click Here to register or call on +91 9820604936/ +91 9820260913 to get your invites.